We are the largest supplier of websites and emails to Parish and Town Councils in England, offering Councils the opportunity to 'get online', and to communicate in a cost-effective way with the local community. Our Award-Winning websites are secure, easy to manage and affordable for your council, and will help you meet the NALC Local Council Award Scheme (Foundation, Quality and Quality Gold Awards). Additionally, all our websites are designed to help your council fully comply with all current legislation and rules such as the Transparency Code for smaller authorities. Choose from our Bronze, Silver and Gold packages below or read our guide to setting up a Parish Council website. Click here to see some of our previous sites. Our Award-Winning website packages are tailor-made for Parish Councils, and we can guarantee that we have the package to suit your needs. 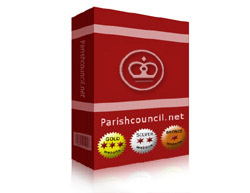 Click here to read more about the new, versatile Site Admin Section - all the software you need to manage and maintain your Parish Council website. 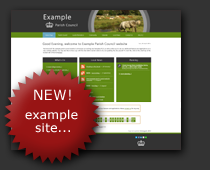 Why not visit our example parish council website - you can even have a go with the SAS to see for yourself how easy it is to update and maintain.